AFTER A BIGGER SIZED BLOCK....HERE ONE IS....SO BE QUICK! When looking to build, especially if you are building to occupy with a family or achieve a higher rental yield on an investment, the bigger the block the better right! 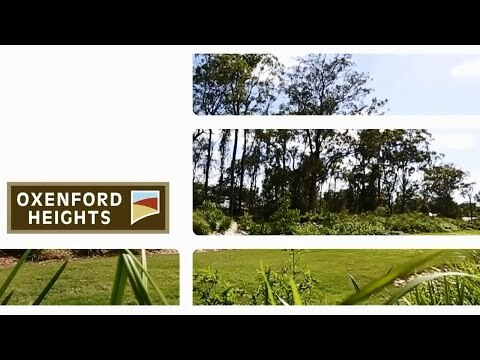 So here one is in desirable Oxenford Heights estate that's elevated up from the road with views and breezes, just near the estate's park and natural bushland buffer, all on a substantial sized 778m2 allotment. Ideal for a split level or double story design, the front of the block faces north, so with a little bit of forethought into designing the perfect floorplan layout, you could imagine relaxing out on a beautiful front timber deck overlooking the trees, listening to the birds and loving the serenity. Perfect sized block to build a larger 4 bed, 2 bath family sized home with 2 living areas and 2 outdoor areas whilst still allowing for side access and a rear yard at the top of the block. Oxenford Heights estate is located at the back of Pacific Pines and only minutes drive to plenty of great schools, shops and M1 for total convenience. You're spoilt for choice with both Pacific Pines and Oxenford at your doorstep with the Gold Coast beaches less than 30 minutes away. Boasting larger blocks, wider street frontages, underground power and Executive style homes, Oxenford Heights is a lovely mix of owner occupiers and investment properties, tucked away in a quiet pocket. Check out our video to get more of an idea or head over to the estate to look for yourself. This is the only re-sale block available so if you are genuinely interested secure it as soon as you can and start looking into making your building dreams become a reality!